Traditionally, one of the most informative and reliable methods for diagnosis of pathologies in organs and tissues are autopsy and histological examination. These methods allow us to estimate both the macroscopic and microscopic structural changes in organs and tissues of humans and animals, and the data obtained in the course of pathological studies, not rarely are of fundamental importance in the study of toxic effects of drugs in preclinical studies. Sufficient qualification of our employees, including graduates of doctors pathologists, specialists in the field of veterinary morphology, as well as experienced technicians, histology, hard work, responsibility and love for his work allows us for many years to carry out pathological and histological examination at the highest level with the use of modern methods of macroscopic and microscopic diagnosis of pathological conditions and in experimental animals. We are always glad to cooperate and expand scientific frontiers. We hope that together we can reach new stages in the development of Russian science and discover new unknown faces in the field of anatomy and histology of humans and animals. The most important step in conducting a post mortem examination is to compare the macroscopic and the microscopic picture of pathologies. Particular attention is paid to the dynamics of the development of pathologies in animals in the experiment. We apply methods of pathologic diagnosis are common, and have yielded positive results in toxicological studies, and in assessing the impact of specific drugs and the study of reproductive and fetal toxicity. Here are some aspects of our work. 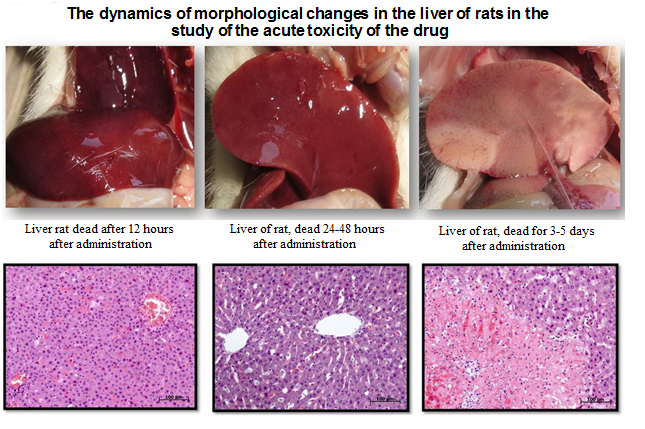 The introduction of large volumes and high doses of drugs in the acute toxicity studies are often accompanied by dystrophic and necrotic lesions of liver tissues, which can be observed in postmortem histological examination of cadaveric material. In the study of atherosclerosis applied macroscopic and microscopic staining of the aortic intima dye Oil Red (oil red), which allows good visualization of lesions atheromatosis. 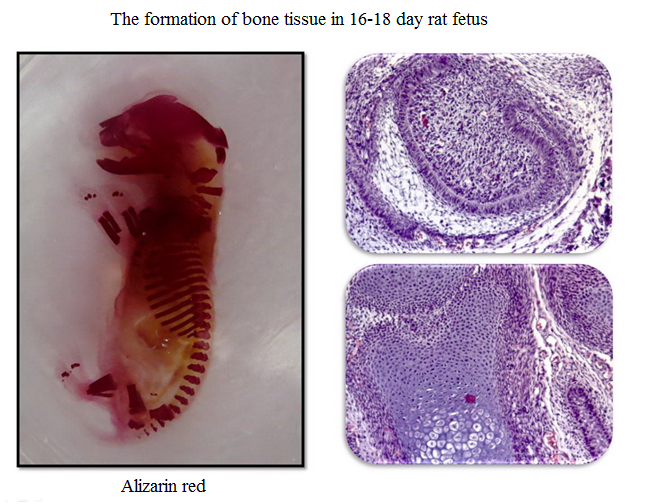 In experiments to study the reproductive and fetal toxicity deviations in osteogistogeneze fetuses to determine who carried out staining of cartilage and bone skeletons Alizarin red. 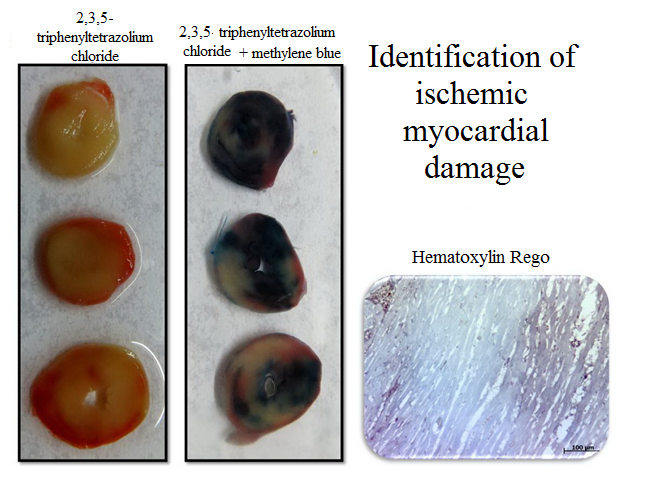 To determine myocardial ischemic lesions we use complex macroscopic and microscopic methods coloring material and the coloring 2,3,5-triphenyltetrazolium chloride based on determining the overall activity of the tissue dehydrogenase. Computed tomography (CT) of organs and tissues of the experimental animals is one of the most promising areas of instrumental diagnostics both in terms of a more complete picture of the disease, and from the standpoint of the humane treatment of animals. 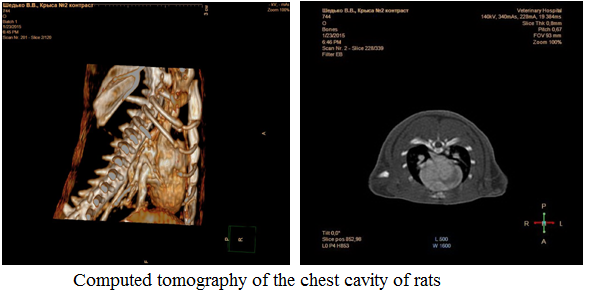 CT allows assessment of his lifetime lesions, study the dynamics of the disease and the effectiveness of treatment without the need evtanazirovaniya animals at all interested control points of the experiment. At the same time, the use of CT significantly expands the notion of localization of various lesions, the degree of their severity and pathogenesis of the disease, allows to obtain reliable data, correlated with the results of conventional morphological studies in real-time. Histochemical methods of research for many years are used by researchers in the study of the normal structure of organs and diagnosis of pathological states. Histochemical staining techniques can detect tissue structures of interest, to identify and evaluate morphometrically organ damage such as tissue fibrosis, muscular dystrophy, and other pigments deposits. However, they do not exhibit species specificity, which is a great advantage when for different types of animal studies. Immunohistochemistry studies of organs and tissues of animals used for experimental and diagnostic solutions tasks received in recent years widespread mainly due to the selectivity and high sensitivity of the used markers. These methods are relevant and most informative in studies on diabetes, neuropathy, pathologies of the cardiovascular system and endocrine organs. In our work we use a wide range of immunohistochemical markers that are designed to not only the architecture of the tissue structure of the cells, but the mechanism of action study drugs. The most important tasks of anatomical science and morphology as a whole is to define interspecies differences in the structure and syntopy organs in animals. These data are the basis for the development of surgical approaches and the implementation of a large number of experimental conditions such as ligation of arteries and veins, intravascular injection, and others. The information as relevant when selecting dosage forms that are often associated with the anatomical structure of organs in animals. We aim to expand the existing knowledge of comparative anatomy and experimental animals receive the most striking anatomical specimens showing the structural features of the bodies of animals which can not be seen at autopsy. Histological archive contains all the necessary information about the experiments to allow retrospective analysis micropreparations, paraffin blocks and organs of animals. 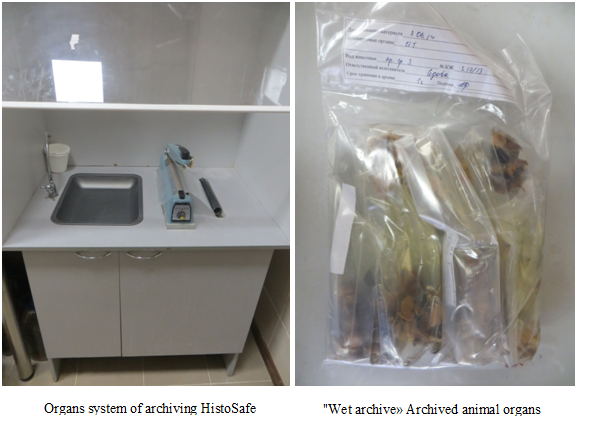 To archive animal organs we use HistoSafe system. The material is placed in a strong plastic bag containing 10% buffered formalin, after which the package is sealed and organs throughout the backup period is stored in a sealed package. 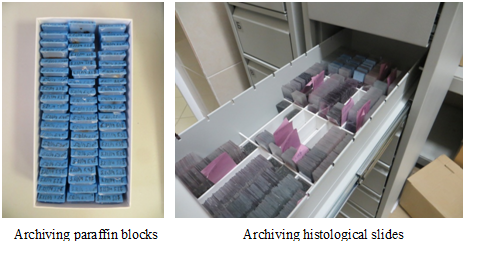 Histological slides and blocks are archived in separate shelves to store the identification numbers of the experiment. 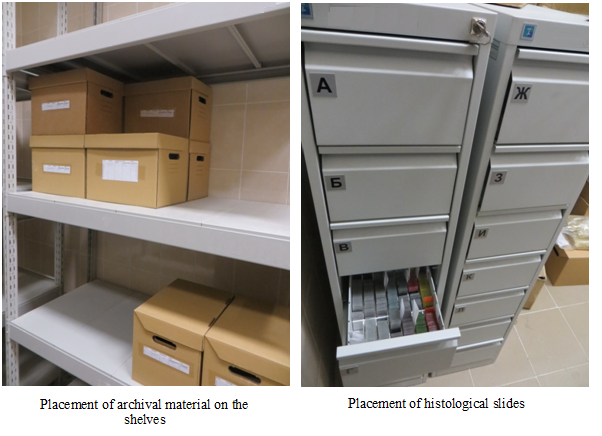 Histological archive room is equipped with shelves, on which is placed the material to be stored. Muzhikyan AA, Makarova MN, Gushchin AA Features mortem examination group of experimental animals // International Bulletin of Veterinary Medicine. -2014, №1. -P. 75-80. Muzhikyan AA, Makarova MN, Gushchin JA Features histological working of organs and tissues of laboratory animals // International Bulletin of Veterinary Medicine. -2014, №2. -P. 103-108. Kashkin VA, Shekunova EV, Muzhikyan AA, Makarova MN, Makarov VG Comprehensive assessment of the degree of pathology in modeling the adjuvant-induced arthritis in rats // International Bulletin of Veterinary Medicine. -2015, №1. -P. 92-103. Katelnikova AE, Kryshen KL, Muzhikyan AA, Makarova MN, Makarov VG acute inflammation model: carrageenan air pouch // International Bulletin of Veterinary Medicine. -2015, №2. -P. 78-87. Muzhikyan AA, Makarova MN The use of computed tomography in the evaluation of the state of organs and tissues of laboratory animals // International Bulletin of Veterinary Medicine. -2015, № 4. -C. 73-80. Makarova MN, Tesakova SV, Samusenko IA, Stolaschuk NV, Solovyov DE, Zhorina AS, Tikhonov VP, Makarov VG Experimental study of the effectiveness of biologically active food additives and drugs in a model of chronic prostatitis // Bulletin of St. Petersburg State Medical Academy. II Mechnikov. -2007. № 2 (8). -P. 123-128. Tesakova SV, Makarova MN, Makarov VG, Samusenko IA, Gushchin JA The effectiveness of the use of drugs with a high content of phytosterols in the treatment of chronic prostatitis // Bulletin of the Research Center of Volgograd. -2009. Number 2. C. 35-39. Tesakova SV, Samusenko IA, Karachinskaya IV, Kryshen KL, Abrashova TV, Makarova MN, Makarov VG The experimental model of cervical lymphadenitis in rats to evaluate the anti-inflammatory efficacy // Preventive and clinical medicine. – 2011. – №1 (38), pp 57 – 63. Proshin SN, Makarov VG, Makarova MN, Kryshen KL, Kovshin AV, Samusenko IA Ulcerative nonsteroidal anti-inflammatory drugs and hepatotoxicity of nimesulide in an experiment on rats // Surveys on the wedge. Farmacol. and lectures. therapy. -2012. – Vol.10, №1. – P.28-34. Khodko SV, Makarova MN, Makarov VG, Samusenko IA, Shirunova MG The experimental model of acute rhinosinusitis in rats to assess the therapeutic efficacy of drugs // Preventive and clinical medicine. -2013. -T. 46, number 1. C. 57-62. Shedko VV, Gushchin JA, Muzhikyan AA, Makarova MN Retrospective analysis of histological archive // Development and registration of medicinal products. -2016, № 3. C. 162-165. Muzhikyan AA, Khod’ko SV, Gushchin Ya.A., Makarova MN, Makarov V.G. Histological changes in the lymph nodes of rats during the modeling of acute cervical lymphadenitis // International bulletin of veterinary Medicine. -2017, No. 1.-C. 75-83. 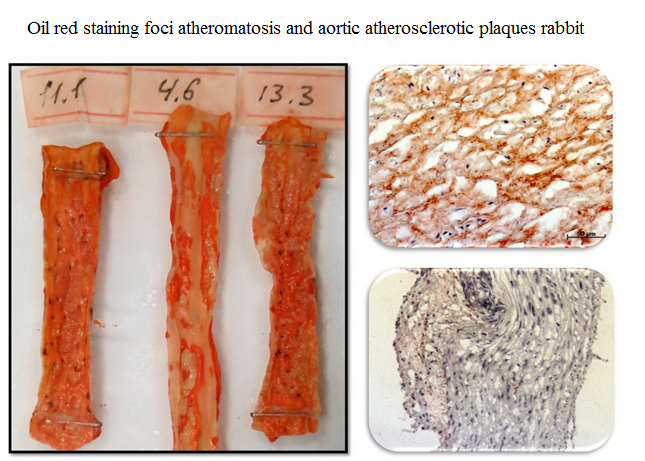 Gushchin YA, Muzhikyan AA, Selezneva AI, Makarova MN Complex morphological evaluation of atherosclerotic damage of the aorta of rabbits in the experiment // Atherosclerosis and dyslipidemia. -2017. No. 1.-C. 50-59.